With Marvel Minimates Series 27 and 28 now in comic stores and new assortments arriving in Toys R Us stores nationwide, the Marvel Minimates line is picking up steam for a knock-out and record-setting 33rd series of the world’s #1 block figure! 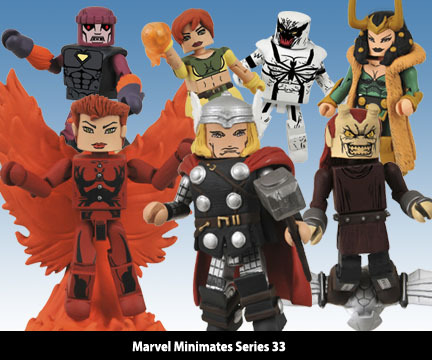 The 33rd Series of Minimates includes new versions of your old favorites, recent additions to the Marvel Universe and essential team members from Marvel’s substantial archives! 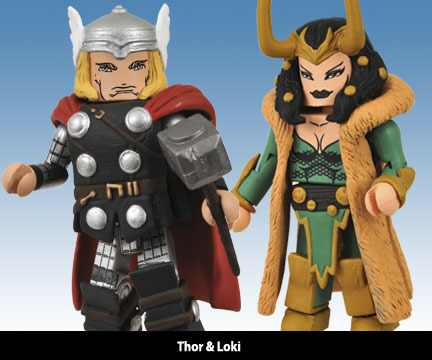 The first two-pack in this oft-requested assortment contains two of the most powerful Asgardians ever to roam Midgard in their new signature looks – Thor and the newly-voluptuous Loki. Spider-Man’s friends and foes make a cameo as well, with two all-new characters featured in the critically-acclaimed “New Ways To Die” – the anti-hero Anti-Venom and the menacing Menace. 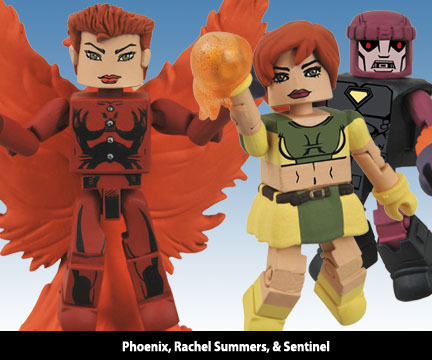 The final two-pack combines fans’ love of all-things Phoenix with their love of evil robots – more specifically Rachel Grey as Marvel Girl and the nefarious Sentinel army builder. 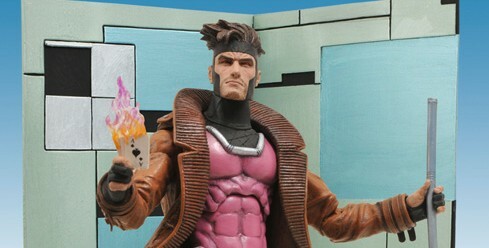 A special chase two-pack will also be included in each assortment, – featuring the Sentinel with a slightly younger Rachel Summers in her classic Excalibur “Hound” costume! In addition to the standard removable and interchangeable pieces, the Sentinel army builder featured in this wave will also include a special “Sentinel Army” design feature – allowing you to partially customize your own Sentinel Squad in either modern or retro styles. 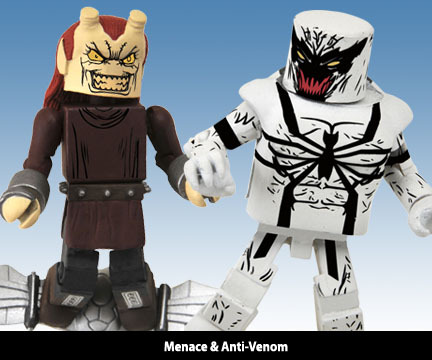 Look for this exciting new assortment in comic stores early next year and keep an eye out for more fantastic new exclusives as the Marvel Minimates line continues to deliver new pint-sized heroes, villains and teams like never before!